Canon T3i/600D vs T2i/550D vs. 60D vs. 7D, etc. Like many others out there, you are asking yourself, “should I buy the Canon 7D or 60D or 50D or 550D / T2i?” It’s a difficult question because at this point the three dSLRs in the current Canon consumer line-up (EOS 60D, EOS 7D, Rebel T2i/ EOS 550D) all share a number of specifications and features, a similar exposure metering system, as well as an image sensor that is nearly the same, and all with 18 megapixels. So how do you choose between the Canon 60D, the T2i (550D) or the 7D? This decision has become infinitely more difficult (or perhaps infinitely simpler?) because the image quality and ISO performance of these three cameras will be nearly identical, and all are capable of taking high quality images. So as I like to profess, you need to choose which camera is best for you based on your needs and experience as a photographer and based on how the advanced features, controls, and customization options fit those needs and serve the way you work. When you are trying to determine which camera to purchase or upgrade to, you need to first consider and determine your needs, and then see which camera fills those needs. Not the other way around where you look at the new features and speculate if you really need or will use them. I will discuss how to go about this in more detail below. Review of Canon EOS 60D vs. 50D: Since the Canon EOS 60D basically replaces the Canon 50D (well, replacement isn’t exactly the right word because the 60D doesn’t really follow the 20D to 50D progression of improvements…), the 60D or 50D decision is an easy one. The 50D shouldn’t really be considered anymore. While the Canon 50D does hold a couple interesting advantages over the 60D (faster frame per second (fps) burst rate in continuous mode, stronger construction, more comprehensive buttons and controls, complete lack of fun filters like “grainy black and white”), the sensor and exposure metering system have been greatly improved in all the newer cameras (7D or 60D or 500D/ T2i) and I feel these features, along with the increase in mega pixels, outweigh any other 50D advantages. I would definitely choose a 60D instead of a 50D. This is coming from experience, as I use a 50D professionally and on a daily basis. Or choose a 7D instead of a 50D if your needs require it and budget allows it. (Find out below if your needs require it!) Digital cameras are somewhat disposable. Yes, even $1000 digital cameras. Within 5 years, your new camera will have become old, outdated equipment. The 50D is already two year old technology, so if you start with one now, in 4 more years it will be absolutely archaic! (Actually, since the 50D was just the 40D with a couple more megapixels, it is even older technology than that.) With digital SLRs, I advise buying a recent model, at whatever price range you can currently afford. Of course as with everything in digital photography, this is relative. The 50D is still an excellent camera. And camera companies have to keep coming out with new models every 12-18 months because that is what they do. The trouble comes in 2-3 years when your 50D is still perfectly good and still pretty new to you, but it can no longer compete with the latest offerings in terms of megapixels, ISO performance, and autofocus systems. If this hasn’t convinced you and you still want to consider the 50D for cost or other reasons, I write in more detail about the 50D vs. 60D comparison here from a camera features and operation point of view. Before I get more into it, I want to mention that I have written eBook user’s guides for the Canon Rebel T3i/ EOS 600D, the Canon Rebel T2i/EOS 550D, and the Canon EOS 60D. After spending so much time studying, experimenting, writing about, comparing, and discussing these cameras, I decided to put all that knowledge into eBook form! Each of these user’s guides cover all the Menu settings, Movie Mode menus, and Custom Function settings – with recommended settings – plus discussions of how, when, and why to use the cameras’ settings and features, (metering modes, aperture and shutter priority modes, advanced autofocus use, and more) for everyday and travel use, to help you take better photos – Your World 60D, Canon T3i Experience, and T2i Experience. Learn more about the eBooks by clicking on their titles. Sensor and Image Quality: As I said above, all three cameras share a very similar sensor and 18 megapixels, and so their image quality will be virtually the same. All are capable of taking professional quality images. Exposure Metering: The three cameras all share the latest 63-zone exposure metering system and 4 metering modes. That means they will all determine the exposure virtually identically and enable you to take properly exposed photos in most every situation, including difficult back-lit scenes. The size of the areas metered for Partial and Spot metering vary slightly between the cameras, but that isn’t anything critical. Autofocus: The 60D shares a similar autofocus system to the T2i and the previous 50D, with 9 focus points and three auto focusing modes. However the 9 AF points of the 60D are more sensitive than those of the T2i: all are cross-type in the 60D, only the center is cross-type in the T2i. The 60D autofocus system is much less complex than the sophisticated AF system of the 7D with its 19 AF point system and its additional Zone, Spot, and Expansion focus modes. These various modes address how you want to deal with and group these numerous AF points. Plus the custom settings of the 7D allow one to customize how the AF system works – how it tracks subjects, how it deals with objects that come between you and your initial subject, how quickly it responds to these changes of possible subjects that are at different distances from you, etc. However, if you are not an avid sports photographer, a wildlife shooter, or someone who understands, needs, and will use the elaborate features of the 7D AF system, then this shouldn’t dissuade you from the 60D. Construction: As you can probably figure out from the prices, each camera is not built the same. The 60D has relatively strong construction of aluminum and polycarbonate. It is better built than the 550D but not as strong as the 7D’s magnesium alloy frame. The 60D also has some amount of weather sealing – more than the 550D/T2i, less than the 7D. But for most users, including even those using the camera daily or in travel situations, the construction of any of these cameras is far more than good enough, strong enough, and durable enough. Controls: As with construction, the buttons and controls vary with these cameras. Unlike the T2i, the 60D and 7D have nearly every control an advanced photographer needs on the exterior of the camera and they also have the top LCD panel and rear Quick Control Dial that are not on the 550D/T2i. With all the cameras, any controls can also be easily accessed with the Q button and menu or in the other menus on the rear LCD monitor. The top buttons of the 60D set only one setting each, so this is less complicated than the multiple-setting buttons of the 7D. Canon has removed the white balance (WB) button on the 60D that the 7D and 50D have, but that isn’t a big deal – use the Q Menu. Another change on the 60D is that the Multi-controller has been moved from the thumb joystick like the 7D and 50D and placed in the middle of the rear Quick-control dial. This doesn’t change how it functions, and should just be a matter of getting used to the difference. (Unfortunately, I still really do prefer the old design and location.) If you plan on using your camera on Auto or Program most of the time, then the controls of the T2i are more than sufficient for your needs. Menus and Custom Functions: These allow for greater control over customizing how the camera functions. The 60D has many more Menu and Custom Function settings than the 550D/T2i and nearly as many as the 7D. These settings enable you to customize the operation, function, and controls to work how you want them to, including things like exposure increments, peripheral illuminations correction for lenses (fixes dark corners) and customizing which button does what. Since many of the Menu and Custom Function settings can be complicated and confusing, my eBooks on the 60D and on the T2i/550D cover all of these options along with my recommended settings to get you up and running quickly! Wireless Flash: Like the 7D, the 60D incorporates wireless flash triggering. It allows you to trigger multiple off camera flashes at different output levels. The 550D/T2i does not have this feature. Articulating LCD Screen: The big new feature that the 60D has that the other two cameras do not is the articulating rear LCD screen. This may prove useful for videographers, as well as for setting up compositions while the camera is on a tripod, for macro use, or for using it from unusually low or high vantage points. Some users will be able to avoid buying an expensive angle finder because of this feature. There is also an electronic level in the 7D and 60D, visible in the viewfinder, rear LCD, or top LCD. Viewfinder: The 60D has a large, bright viewfinder with 96% coverage of the actual resulting image, a tiny bit better than the 95% of the 550D/T2i but not quite as nice as the nearly 100% view of the 7D. Processor: The 60D shares the same Digic 4 processor as the 550D/T2i. The 7D has dual Digic 4 processors. However, if you don’t need to shoot dozens of continuous images, you probably won’t notice any processing speed issues. Continuous Shooting Speed: The 7D can shoot a blazing 8 frames per second, in which the photos barely change from frame to frame. The 60D can shoot a respectable 5.3 fps which is actually a more useful rate, and is a higher rate than the 550D/T2i rate of 3.7 fps. If you need the extremely high fps for sports, wildlife, or other action shooting, get the 7D. If not, don’t be swayed by this excessive feature. Battery: The 60D uses the LP-E6 battery like the 7D and 5D, which is a nice feature as this battery can often last through a full day of shooting. The T2i uses a smaller battery with less capacity. Size and Weight: The 60D is larger and heavier than the 550D/T2i, smaller and lighter than the 7D. Go to the store and hold them to get a better feel for their size, weight, and feel. AF Microadjustment: The 7D has this feature, the 60D and T2i do not. Many are disappointed that the 60D does not include the ability to micro-adjust the focus so that each lens is completely accurate. However, if you have a focus issue, send your camera and/ or lenses to Canon while under warranty and ask them to calibrate them. Doing AF microadjustment yourself is often a maddening, never ending undertaking. You may make a good calibration under controlled conditions, but this really doesn’t replicate real life shooting. Locking Mode Dial: This is a new feature for a Canon dSLR, only on the 60D, that keeps the Mode dial from accidentally rotating. A nice touch, and not at all difficult to change quickly with one hand, as some people have claimed: just push the center button with your left index finger, rotate dial with thumb and middle finger. Full HD video: Of course they all offer this capability. Note that this is not video for your kids’ parties and soccer games. It does not have continuous autofocus while shooting, as a camcorder does. It is not designed for that kind of use, but rather for serious videographers who typically manually focus. You can adjust autofocus while shooting by pressing the shutter button or the AF button, but it may have a less than desired looking result. Flash Sync: A Note to Strobists -the 60D and T2i do not have a PC sync flash socket to plug in PC sync cords. The 7D has this. Ease of operation: While beginners may find all the buttons, controls, and menus of any dSLR difficult and confusing at first, the additional controls and menus of the 7D and 60D are all quite intelligently designed, intuitive, and straightforward for the more advanced user. Purchasing: If you plan to buy any of these cameras through Amazon.com, (or just wish to purchase anything from Amazon) I would appreciate it if you use this referral link to Amazon or one of the camera links just below. Your price will be the same, and they will give me a little something for referring you, which will help support this blog. Thanks! And due to popular request, if you are in the UK, here is my new referral link to Amazon UK. If you are in another country, click on one of my Amazon links, scroll to the bottom of the page, and click on your country for your local Amazon. And for those wishing to purchase from B+H Photo, just click here for my referral link to B+H. Thanks for supporting my blog! See and buy the Canon 5D MkII on Amazon. Lenses, Accessories and Books: Now that you are on your way to deciding on a camera, you should also start looking into lenses, photography gear, accessories, and books. Check out this link, Best Lenses for Travel Photography, which also applies to general photography, Equipment for Travel Photography, which discusses useful and practical photo accessories and equipment for both everyday and travel photography. This post lists and describes Essential Books for Digital Photography, including the best user’s guides for each of these cameras. Get a Canon 550D / Rebel T2i if you are new to photography or to digital SLR photography, or want to upgrade from an older Rebel because you want higher image quality and more mega-pixels (or HD video). If you have been happy with the features and controls of your previous dSLR camera and have not discovered the need, in your use of it, for any specific additional features, there is no need to look beyond the 550D. 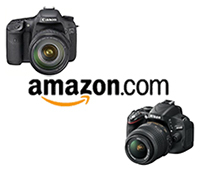 See the T2i on Amazon. Get a Canon 60D if you have outgrown the capabilities of an older Rebel like an XTi or T1i due to your greater experience and more demanding shooting needs which require more direct or sophisticated controls and customization options. Or you have been pretty pleased with your 20D or 40D and its features but wish to upgrade for the increased image quality and mega pixels (or HD video). And/ or you need a more rugged camera for your frequent and demanding shooting and off-the-beaten-path traveling needs. Or if you need the increased 5.3 frames per second continuous rate to shoot sports or action. Or you really like swiveling LCD screens. If you typically shoot on Auto or Program mode, you do not need a 60D. If you do not manually select your own focus point and have never used exposure compensation you do not need a 60D. If you have never used the AE-Lock [*] button to lock exposure you do not need a 60D. If you don’t understand the relationship between aperture, shutter speed and ISO you don’t need a 60D. Or unless you plan to dedicate yourself to learning this camera and the principles of SLR photography and grow into this more advanced camera, please save the money or use it towards a better lens. See the 60D on Amazon. Get a Canon 7D if you have extensive experience with a Rebel (xxxD series like 350D, 400D) or with an older xxD series (20D, 40D) camera, and you know and understand most of the 7D’s controls and advanced custom features, and you specifically need some of them for your demanding shooting needs. If you haven’t passed the above “criteria” for a 60D, you definitely don’t need a 7D. If you have never used Av aperture priority mode or M manual mode, you do not need a 7D. If you have never used autofocus tracking settings to track a moving subject across your frame and worried how an interfering object would affect your focus you do not need a 7D. If you have never used spot metering to determine a critical exposure level or experimented with back-button focusing you do not need a 7D. Or unless you plan to dedicate yourself to learning this camera and the principles of SLR photography and grow into this very advanced camera, please save the money or use it towards a better lens. However, if you often need to take 126 consecutive photos at the rate of 8 frames per second, you do need the 7D. Immediately. Even if you just sometimes need that. Totally worth it. That’s 15.75 seconds of continuous shooting. Who doesn’t need that? You’d make Eadweard Muybridge proud. See the 7D on Amazon. If you don’t already know that you need a 5D, you probably don’t need a 5D. Plus, as is often the case, those who could really take full advantage of a 5D are those who can’t afford a 5D. (I’m thinking about the talented photographers I come across on Flickr, etc. who are making amazing images with entry-level Rebels.) Feel free to spend $2,500 on a 5D Mk II if you want, but unless you have extensive experience with photography and with a digital SLR, using a 5D is completely unnecessary and is unlikely to help you take “better” pictures than you will be able to with a 550D. In fact, until you figure out the controls, features, menus, and custom functions of a 5D or 7D, you may be taking worse pictures! And besides, the 5D MkII becoming old technology. You should wait for the 5D Mark III :) See the Canon 5D MkII on Amazon. Great post, cuts right through the BS and is very informative. Thanks! Nice I like the advice. The 7D is still past me but I think i’ll kick myself if I don’t get it. Hopefully you will “grow into it” as you gain experience! Excellent Post and very informative. I’m considering buying the 60d over 7D coz of the articulating LCD. I just returned my T2i coz’ it had some limitations like while composing a shot if you want to switch metering modes or white balance etc you have always end up push several buttons..I like the top lcd dedicated for viewing the camera settings. I also considered splurging 2500 and indulging in 5d Mark II but the omission of inbuilt flash control and very slow continious frame rate was a deal breaker for me..
With the expected price for the 60D i can’t really see a reason for not directly buying the 7D? You can get it online for even less.. Am i missing something? And apart from fps which might be useful for a lot of people, as you said the quality of the images wouldn’t differ in any of the models.. Having said that one killer feature for me with the new 60D is to take pictures at 1:1 aspect ratio. I just read your review on 7D vs. 60D and found it very informative. I currently own a Rebel XTi and am now getting to the point of wanting to upgrade camera bodies. Based on my homework and needs, I wil likely be going with the 7D. Right now, I’m using an EF-S 17-85 IS USM F4-5.6 lens on my XTi. This made a big improvement over the kit lens. I’m wondering whether the 24-105 F4 L lens would make much difference in picture quality over the same range. I know the build quality of the L lens is superior, but I’m curious if I would actually be able to see a difference in my pictures. Likewise, I also read your article about not buying the kit lens. If I end up purchasing the 7D body, will my 17-85 lens be able to take advantage of this camaras features. Sean, thanks for reading and for your comments and questions. The 24-105 f/4L will make a big improvement over most any non-L-series lenses. Yes, it’s true, you definitely get your money’s worth with the L lenses. I did a lot of work with an older 28-105mm, non-L-series lens, and once I upgraded to the 70-200mm f/4L, I never use the old one again. The images just didn’t look as nice, as sharp, and the color and contrast just aren’t as appealing. Now, this difference may not be as immediately noticeable to everyone. But I look at photos all day, every day – my photos, other people’s photos. I work on them in Photoshop and see and “feel” the differences. When I was working on my photos from a trip to Guatemala, most of which were taken with L lenses, I had a some photos that just didn’t feel the same as most the other ones. I kept wondering what was wrong with them. Turns out, they were the 28-105 photos. I couldn’t immediately tell myself in small preview sizes. But when I open them up in PS, it becomes very noticeable. The old 28-105 image is “flatter” and more contrasty in a bad, loss-of-image-information way. It has darker blacks but not nearly as much gradation from dark to black or gradation in the colors. While these 2 photos aren’t exactly the same for comparison sake, the issue with the blacks, contrast, and gradations was common to all the 28-105 photos. Who knows the actual variation of the women’s textiles and the lighting since they were in different locations of the market, although I know the right one was direct sun (11:59am), and it appears the left one was too (10:48am). Though on the left there were tarps around that could have acted as reflectors, so the lighting on the women’s forearms may have been different from photo to photo. But based on other images, I know that some or most of that variation in the gradation in tones is due to the lens. These lens issues, though, aren’t necessarily obvious unless you are doing side by side comparisons of lenses and images. Your 17-85mm will work just fine with the 7D, but obviously won’t be as nice as an L lens. And it is said that the higher megapixel count of the 7D will make the shortcomings of cheaper lenses more noticeable. I have to agree. An L-series lens with a 7D is definitely a good idea. I recommend renting the 24-105mm for a weekend (you can typically get the one day rate for Fri-Mon) and try it with your XTi. And since the 24-105mm is the kit lens for the 7D, you can save a few hundred dollars buying them together. It is one of the few times I recommend the kit lens! My mistake, that is the kit lens to the 5D MkII. Your pictures make a very compelling argument. I’ve not yet seen the 7D packaged together with the 24-105mm L. I’ve only seen it with the 28-135 or 18-135. If you know of any retailers that do, let me know. You’re right, my mistake! I was thinking of the 5D MkII kit lens, which is the 24-105mm. Where can you find a 7D online for even less than the 60D? I’ve looked everywhere and can’t say I’ve been successful. I think maybe he meant less (than the typical retail price)…? Amazon and B+H typically have the best prices. I wouldn’t buy camera equipment from some unknown online retailer. So if I have the option to win a used 7D off eBay for $1200, or buy the 60D for $1100, what should I do? Try to verify that the 7D on eBay has a reasonable shutter-use count. It is rated for a life of 150,000 shutter actuations, so you don’t want one that has already taken 75,000 pictures. Thanks for the great advice,I own a 400d with a 24-70L,10-22,50mm 1.8 and the regular kit lenses and its time for an upgrade and after reading this I think I will go for the 60d.I was going to buy the 7d but it might be wasted on me. Ok, my typical usage: Cityscapes, Landscape/nature, people/babies, candid shots. I do NOT take sports action shots(atleast not yet), am not a wildlife photographer, and I certainly dont take 126 consecutive shots. I think 60D would be a better choice for my needs and I guess I’ll use the money saved towards a better lens. Thanks again for steering me towards my needs than my wants! Thanks for the comments! Yes, if you don’t really need the complex autofocus system and other advanced features of the 7D, I think you will be quite happy with the 60D and a nice lens. The Canon L-series lenses can really make a big difference in image quality. Regarding buying camera equipment online, it is best to stick with the big name retailers: Amazon.com, B+H, Adorama, Best Buy. Be sure you know their return policies and time frame before you purchase in case there is an issue. Thank you for this post! Exactly the question I am struggling with right now. Which of the 3 cameras has auto focus on the HD video? I keep seeing reviewers complain about having to manually focus during video. I work mostly with still photography and have yet to do much with HD video, so I don’t know as much as I’d like to about it. The 7D, 60D, and T2i do have autofocus capability in Movie Mode, but I believe that it is not continuous auto focus, instead you press a button to refocus when you wish – either the Shutter Button by default or another button that you customize in the Menus or Custom Functions. But I have read that for serious videographers, manual focus is in fact the desired method. You either pre-focus on the subject then start shooting, or use some of the available video accessories, like a magnifying loupe to better view the LCD screen and a follow focus mechanism for precise focus while shooting. Auto focus with video is similar to auto focus on a digital SLR during live view shooting. It is slow, awkward, and cumbersome, and the noise the autofocus motor makes would interfere with the built in video mic. So at this point, until the technology improves, you pretty much want to manually focus with video whether or not a camera has video auto focus. Manual video focus will also give a more professional look in most every video situation. If you have ever watched anyone’s camcorder video, you can see how easily continuous autofocus jumps around from one distance or subject to another or loses focus, and a videographer who wants control of their camera does not wish for this to happen. I am basically a laid back working woman, a mother to be who likes to take picture of myself and the family and travel ALOT.. so, i really need a camera with a lighter body but can do wonders. so.. im still stuck between 550D and 60D comparison. my baby boy is coming in february, so, the new camera will take mostly of my little one’s pictures.. Thanks for your comments. Actually, I should modify my comments and be a bit more lenient. If you don’t yet understand more advanced camera controls, BUT are willing to learn and think you may grow into a more advanced camera, then that needs to be taken into consideration too! Go to the store and hold the T2i and the 60D and see the difference in size and weight. That may help make up your mind right away. I use a super zoom model, a sony H9 and I am taking pictures in manual. But the controls for manual and the viewfinder is terrible, I need something better. Do you think it´s better to skip the t2i and go straight to 60D? And, about the lens, why don´t you recomendo the canon 17-55 2.8 ? For what I have read, this lens has the quality o a L lens, it is not classified as a L because it is for cropped sensor. Can I stick with the 17-55 2.8 to be my main lends? As previously mentioned, super great article!! Thanks for writing and making me realize I don’t need a 5d mark ii because I don’t use the manual mode much. Maybe I should just spend money on more quality lenses!! Great job! Very exciting article, I was hoping to learn about about the 5D mk i. I’m currently deciding between that and the 60D/7D. I tend to shoot more wide angle, so the crop factor would usually be working against me. I have shot with a canon rebel G2 since it came out. This will be my firest Dslr camera. I tend to mostly shoot full manual and often am unhappy with how my autofocus works, so I go to manual. Additionally, I’ve gotten by with stock Tamron lens for the last 6 years, the 28 to 80 and the 70 to 300 (both slow at 3.5 to 5.6). YOu could say that I’m not really attached to canon, but It would be nice to stay with them, since thats what I know, I’m thinking about upgrading my film camera to an older pro camera and most have told me that it doesn’t really matter. I would like to eventually purchase the 17 to 40 L lens or equivalent soon (hopefully if I sell some prints, a faster lens). Video features are interesting, but not the most important. I have about 1500 to spend, so the mk ii is not an option. Thank you for your article. I had thought I wanted a Canon 50d but after reading your article, I am not so sure. I am now thinking the Canon 60d or the 7d. I love taking sports photos of my kids and others and have recently been taking sports photos for the local paper. I still have a lot to learn but very much want to take professional looking photos. I currently have a Canon Rebel XTi with lenses EF 24-70 f/2.8 and a EF 70-200mm f/2.8 . Any suggestions you have would be appreciated. I am open to learning and don’t want to buy something to then wish I had gotten something else. You have really great lenses, and you should definitely hook them up with a larger, sturdier body. Since you shoot a lot of sports photos, you should definitely consider the 7D. Its sophisticated autofocus system and its 8 frames per second burst rate are perfect for sports and action. The 60D is also a capable camera, but for photographing sports, you may want more than its simpler AF system and 5.3 fps burst rate. Your article was like ice cold water in my face. All my life (33 now) was trying to get away with low end camera and for once I decided enough is enough. Then I read this (by accident). Long story short – third day reading brought me down from 5D to 7D, then your ‘vague’ paragraph about 5D.. smack in the face. Now I will be getting the 60D(more cash for lens).. You definitely know how to write – thanks a million. Any advice on good 60D matching lenses for portrait and landscape photography? btw, would love to use your amazon link when I but, I am in UK. Any alternative that can be of any use to you? Try this referral link for Amazon UK – thanks for your support! Thank you, thank you, for this article! I have read reviews, and researched and waffled back and forth between the 7D and 60D, and finally, I think I’ve made my decision to get the 60D. I’m upgrading from the Xsi (450D). I played with my DIL’s 50D with my 50mm 1.4 (sweet combination!) and thought maybe that’s what I would do, but your comment about the 2-3 year old technology in that being even more behind in a year or so, did it for me. I’m not doing shots of sports anymore, SIL can do that, but I take photos traveling, grandbabies, indoor shots, landscapes, and some macro. The Xsi has taken good photos and has been pretty dependable (maybe mostly because of my lenses — the 50mm 1.4, 24-105mm L, and my 70-300mm IS DO). I’m spending more time using manual, and fighting with the buried menus, where changing things means 2 hands and tinkering looking at the back of the camera instead through the lens! So do those lenses sound like a good match for the 60D? Those lenses will definitely be happy on the 60D! I’m glad you found the info helpful. Don’t forget to check out my ebook “Your World 60D” to help you dig into the menus and custom functions of the 60D! Fantastic post! I think I am going to work myself into the 7D. Seems to me it will hold my attention for my more experienced days coming up. I think I will have fun rediscovering more of the features in the future. Thanks! Hey thanx for the lovely explanation, was really debating between the 60D, 7D and the 5D MarkII. But seems like the lack of internal flash in the 5D and the lovely articulating screen in the 60D will make me go for the 60D. I owned a 550D which i just sold yesterday. I do a lot of travelling in the world and shoot interiors so hope the 7D is not required. Have a tamron 18-270 and a 10-24mm lens to go with. Fantastic article. I just about purchased the 7d the other day to upgrade my 2006 Rebel. Based on your “Get a ____” statements above the 7d would probably be too much for me. The 60d may still be a bit much for me but I do have the desire to learn more and grow with the camera. I have 3 kids all involved in school activities particularly sports and other out door sporting activities. I think with the money saved between the 7d and 60d I will go ahead and bite the bullet and purchase my dream lens the L series 70 – 200 2.8 lens. The lens will probably do more for me than the advanced options of the 7d would ever do at this juncture in my life. Thanks for a great article that is very well written. Thanks for your feedback! Enjoy the 60D and your dream lens! Be sure to have a look at my eBook for the 60D – “Your World 60D” now available as a PDF from this blog, Kindle version on Amazon.com, or Nook version at BarnesandNoble.com. If you plan to use the camera beyond Auto or P mode, and know how or will learn to change ISO, apertures, and custom function settings, get the 60D. In that case you will outgrow the T2i, but it will take quite a while to outgrow the 60D.